April 2013 - I started teaching my first yoga class on a Wednesday evening as a Student teacher with my friend and shipmate, Helen Edwards. We were both super nervous and ecstatic when 6 people turned up for our very first class. November 2103 - now fully qualified Dru Yoga teachers, we started to branch out to more classes but we were both working full time.  My jewellery business Kate Hamilton-Hunter Studio was very full-time at this time so evening classes only! June 2015 - Helen and I start separate classes in various venues across North Wales. May 2016 - I make the tough decision to close my jewellery business of 12 years, take the summer off and get ready to teach yoga full-time. September 2016 - I created a Yoga Space in my home and started teaching small intimate classes at home, and drop-in classes at Mochdre, Eglwysbach and Glan Conwy Village Halls. January 2017 - started teaching two classes a week in the Pilates studio at Peak Physio & Fitness in Llandudno Junction. September 2017 - I started running weekend workshops. October 2017 - I closed all my drop-in classes focussed my time and energy to teaching small intimate classes at my Yoga Space. I'm still teaching two classes a week at Peak. 2018 and 2019 - my classes are now up to 8 at my Yoga Space and 2 at peak Physio & Fitness. Since September 2017 I have run monthly workshops for my students and local people, connecting via social media. I have run some on my own for 2.5 hour workshops and have also enjoyed teaming up with local facilitators to present new experiences for local yogis. February 2016 - I started helping Laura Bell with her successful yoga retreats on Anglesey which combine fitness and yoga. I start off teaching a gentle Saturday evening class and staying for supper. Laura tells me soon after she is pregnant and would like me to run her retreats for her from September. I am thrilled and honoured that she trusts me with her yoga-baby and start training up on every aspect of hosting a world-class retreat. September 2016 - I run the 5 retreats in the run up to Christmas, hosting, teaching yoga, serving meals, helping in the kitchen, co-ordinating all the different providers coming in to provide coaching, massages and activities. January 2017 - I ran 9 out of the 10 retreats in the Spring programme, taking the guests to beaches and waterfalls, wild swimming, Stand-Up Paddleboarding. September 2017 - I ran 5 of the Autumn retreats for Laura this year and will be running plenty more in 2018. I love this job! Meeting lovely people and teaching a variety of yoga classes, indoors and outside whenever possible, often with an evening pyjama Meditation class too! 2018 - I have hosted 14 Yoga Retreats for The Zest Life this year and we have many guests returning to beautiful North Wales and Plas Cadnant. 'Top 6 Yoga Retreats to visit in Europe' by The Independent, 2014. 'One of the Top 10 yoga retreats in the World' by The Times, 2016. '25 Greatest Yoga Holidays on the Planet' by The Telegraph in June 2017. On completion of my Teacher Training I was invited to return to Dru as a Support Tutor for the next contingent of student teachers. My role as a Support Tutor was to support both the students and the senior tutors. I supported two courses and was proud to see most of the students pass their finals with flying colours and stepping into the world of teaching yoga in their own unique ways. I have now hung up my hat in this role as I develop my own yoga business. In 2015 I ran 4 workshops on Yoga, Breathing and Relaxation for as part of a Stress Awareness Progamme for staff at this housing association. From May - June 2016 I was invited to teach in a Dru Yoga programme, helping NHS staff at Ysbyty Gwynedd in Bangor with gentle yoga movements, mindfulness, breathwork and relaxation for an 8 week period. All the participants wanted the programme to continue! It was a great experience and pleasure to help some very stressed-out staff at the hospital. From September - December 2016 I ran the Conwy classes for Dr Ned Hartfield's Healthy Back Programme. The programme was designed for staff who work in a variety of job roles for the local council and who had previously taken sick leave with back problems. The idea being to prevent recurring sickness absence. The programme was well received and successful in helping people manage acute pain and take skills away to help with their jobs and lifestyle. May 2017- Yoga Class in the tippee at the Surf Snowdonia site for Keep Wales Tidy conference. June 2017 - Yoga Class for the Rip Curl kids week. "I view teaching a class as a meditation." Erin Joosse.